The Vapor-logic controller provides comprehensive control for DriSteem GTS®, STS®, Vaporstream®, Vapormist®, Humidi-tech®, CRUV®, XT Series humidifiers, and evaporative cooling and water treatment systems. This latest version of DriSteem's controller includes new LEDs that indicate the status of the humidifier and display for easy trouble-shooting functionality. Alarms and/or diagnostic messages that might prevent unit operation. Communication status to the keypad. An additional LED shows if power is available to the keypad/display. The red control board is easy to identify and has been updated with new components to assure performance and reliability well into the future. It is backward compatible to and has all the capabilities of Vapor-logic version 5 and 4 controllers. DriSteem's Vapor-logic version 6 controller is available as an upgrade kit, allowing older DriSteem humidifiers to gain all the benefits of our newest controller. The kit includes everything needed to make the upgrade. The upgrade kit is available for the following humidifiers operating with Vapor-logic: GTS, STS, Vaporstream, Vapormist, Humidi-tech, and CRUV. Interoperability allows communication with building automation systems via Modbus®, BACnet®, or LonTalk® protocols. Web interface provides the capability to set up, view, and adjust humidifier functions via Ethernet, either directly or remotely through a network. USB port allows easy firmware updates, and data backup and restore capability. PID control allows tuning of the system for maximum performance. Real-time clock allows time-stamped alarm and message tracking, and accurate drain and flush scheduling. 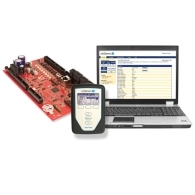 Programmable outputs allow remote signaling and device activation. Enhanced diagnostics include a test outputs function to verify component operation, and a test humidifier function to simulate humidifier demand to validate performance. Auxiliary temperature sensor/transmitter allows air temperature monitoring, such as in a duct, and enables temperature compensation to prevent window condensation.